A yummy twist to traditional mac n cheese, made with shell shaped pasta and kicked up with flavor from Campbell's Classic Cream of Chicken Soup. onion powder	 4 1/2 tsp. yellow mustard	 4 1/2 tsp. 1. Cook macaroni according to package directions. Rinse and drain. 2. 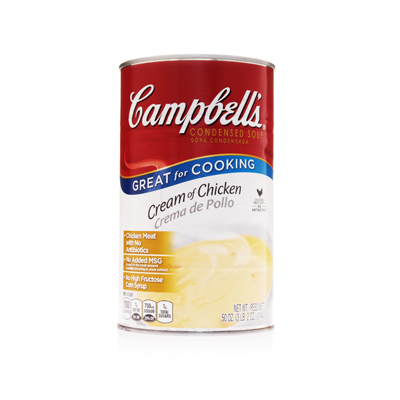 Combine Campbell's® Condensed Cream of Chicken Soup, onion powder, pepper and mustard in large bowl. Gradually stir in milk and blend well. 3. Add cheese and cooked macaroni to soup mixture. Stir well. Divide evenly between 2 hotel pans (20x12x2). 4. Bake at 350º F. for 35 to 40 minutes. Remove from oven. Sprinkle with paprika. CCP: Heat until internal temperature is 165º F. or higher for 15 seconds, stirring halfway through heating. CCP: Hold at 140º F. or higher. Stir before serving. 5. To Serve: Portion with No. 12 scoop (1/3 cup).